Robert Rauschenberg, a key figure in early Pop art, admired the textural quality of Abstract Expressionism but scorned its emotional pathos. His famous "Combines" are part sculpture, part painting, and part installation. Allan Kaprow was an American painter, collagist, assemblagist and performance artist. Kaprow was best known for trailblazing the artistic concept "happenings," which were experiential artistic events rather than single works of art. 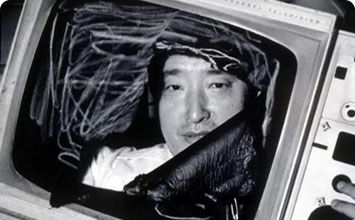 Nam June Paik worked with a variety of media and is considered to be the first video artist. Paik is credited with coining the term "information superhighway" and was known for making robots out of television sets. Incorporating a background in science into his art, Rafael Lozano-Hemmer is known for theatrical installations that utilize robotics, computer graphics, film projections, internet links, video sensors, and LED screens. Lozano-Hemmer's works explore the urban condition, perception, deception, and surveillance. Merging technology with Conceptual art, Jill Magid's works investigate systems of power (i.e. the military, police, and CCTV) and individuals' relationship to them. A pioneer in the field of Digital art, Schwartz made a name for herself creating 'computational' art in the 1960s and 1970s, before computers were widespread. Schwartz used computers to make paintings, films, and drawings. Cao Fei creates art using video, performance, and digital media to examine the every day life of Chinese citizens born after the Cultural Revolution. She also delves into the concept of the border between dream and reality, internet culture in China, and the social and cultural transformations in contemporary China. Examining the concept of physical bodies in digital spaces, Petra Cortright is best known for her video, painting, and digital media works. Cortright often features herself in her videos; she's been taking 'selfies' before the word entered the pop culture lexicon. Putting a new twist on Appropriation art, Cory Arcangel explores the relationship between digital technology and popular culture. Repurposing Photoshop gradients, Youtube videos, and even the Super Mario video game background, Arcangel creates art in a variety of media, including video and digital. Not since the advent of the camera has something come along to change the very fabric of art making's possibilities on such a grand scale as digital art. In its most distilled essence, digital art encapsulates an artistic work or practice that uses any form of digital technology as part of its creation or presentation process. As the digital age (also known as the information age) marked its march into the world between 1950 and 1970, it was only a matter of time before artists would grasp its progressive technologies for their own creative output. As with all new mediums, artists began to wield these brave new innovations of society, including television, the introduction of the personal computer, the accessibility of audio and visual software, and eventually the internet, into works of their own, with minds ever eager for the expansive opportunities to utilize contemporary means to evolve their voices anew. Although digital art is not recognized as a distinct movement in and of itself, as technology continues its jackrabbit fast bloom into contemporary society, we will no doubt continue to see it unfold into a myriad, ever-changing landscape, solidifying itself as a credible alternative to traditional means of art making for a post-millennial society. At its inception, digital art marked a relationship between artists and engineers/scientists, which explored the connections between art and technology. As artists began to explore these technologies, they were not merely using the new medium but were oftentimes also asking viewers to reflect upon the impact of the information age on society overall. Digital art greatly expanded the artist's toolbox from the traditional raw materials into the progressive new realm of electronic technologies. Instead of brush and acrylic, artists could now paint with light, sound, and pixels. Instead of paper, artists could collage with found digital imagery or computer-generated graphics. Instead of physical, two-dimensional canvas, artists could concoct three-dimensional graphic works for projection on screen or via multimedia projection. Digital art revolutionized the way art could be made, distributed, and viewed. Although some digital art leans heavily on the traditional gallery or museum venue for viewing, especially in the case of installations that require machinery and complex components, much of it can be easily transported and seen via the television, computer screen, social media, or internet. This has empowered artists to create their own careers without the necessity of representation, utilizing contemporary tools like crowdsourcing to fund their work, and the potential to go viral to spread their art into the mainstream consciousness. First published on 03 Oct 2017. Updated and modified regularly.